Ask anyone to describe St Tropez properties, and they will describe an almost legendary location at the heart of the French Riviera that has become so embedded in popular culture as to be synonymous with luxury, glamour and celebrity. Even the most casual observer will recall iconic images of Hollywood greats walking the sun-drenched boulevards, of open-topped sports cars touring the hillside roads, or of luxury yachts bobbing against the backdrop of the glittering Mediterranean. 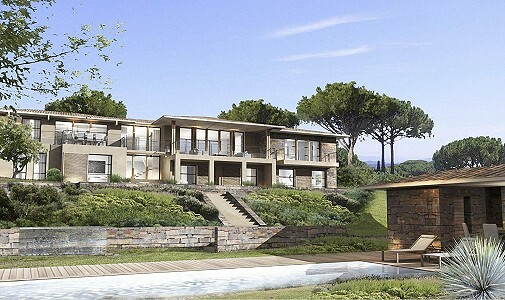 Today, St Tropez properties still offer a unique opportunity to buy in arguably the most iconic resort of the 20th century. From the luxury marina bordered by waterfront restaurants, to the old quarters of the town packed with exclusive designer boutiques, the St Tropez lifestyle is all about providing the very best life has to offer and offering both relaxation and excitement in equal measure. St Tropez properties are located in one of the most beautiful regions in France, in the Var department of the Provence-Alpes-Côte d'Azur. While the town itself is beautiful, the landscapes beyond the town limits are truly spectacular. The hills around the town rise majestically from the sea, and are crowded with fields, vineyards and olive groves, as well as small villages where St Tropez properties can also be found. The countryside can be enjoyed on foot, bike, horseback or even car, but often the true heart of St Tropez is found by the sea. Once a small fishing village - indeed many older St Tropez properties are traditional fisherman’s cottages - St Tropez boomed as a resort in the 1950s with the influx of the rich and famous. The old fishing harbour has been transformed into the modern yachting marina found today, and the many berths ensure that St Tropez properties are popular with boating enthusiasts. The iconic marina is a truly 21st century installation, despite its humble beginnings, and has a host of facilities for enjoyment both on and off the water. The long, wide sandy beaches of the Baie de Pampelonne are never far from any of the St Tropez properties. Stretching to over 5km, the beaches provide a wealth of activities and sports along their length, and are divided into both public and private areas. The separate beaches for swimming and relaxing away from the more adrenaline fuelled water sports such as jet-skiing and water-skiing ensure that both fun and relaxation in the sun are always available. St Tropez properties also have access to a great number of more formal sporting activities, including a wide range of tournaments and competitions. There are many dedicated sports centres, gyms, and both indoor and outdoor facilities to enjoy almost every conceivable sport. Nightlife and entertainment in the town is both abundant and diverse. St Tropez properties can be found in both the bustling centre and the quieter districts, allowing access to a whole host of entertainment venues. The more tranquil areas of the town are home to some of St Tropez’ best restaurants and café bars, while the heart of the town offers everything from casinos and nightclubs to cinemas and live music venues. Although St Tropez found worldwide fame in the 1950’s, much of the character of the old town still remains. St Tropez properties can be found in the old quarters where the true Provencal way of life is still seen in the traditional markets, including the ancient fish market that thrives by the archway to the old town. Many of the markets specialise in fresh, local produce, including truffles and the area’s famous wines. 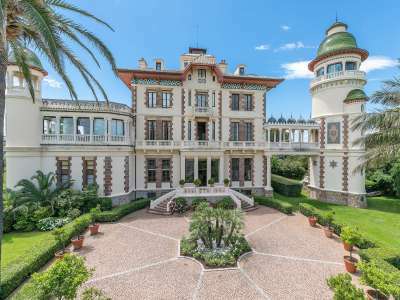 St Tropez properties found in the old town are also located near to a great number of museums, galleries and cultural exhibitions, often housed in historic buildings with spectacular architecture. 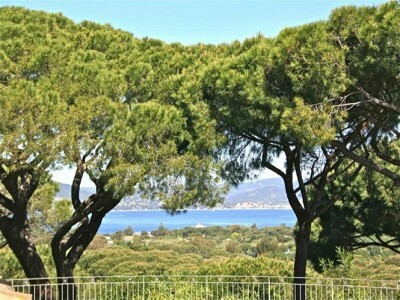 The fame of St Tropez is not just due to the celebrities, artists and actors that have resided in St Tropez properties, but the fusion of ancient charm, modern facilities and beautiful natural sea and landscapes that still exists to the present day. 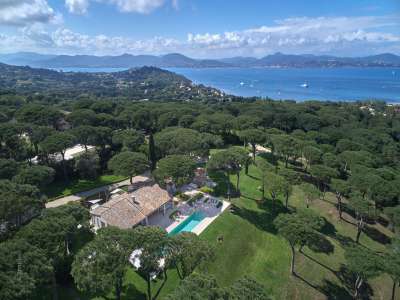 This most impressive residence (including a 2 bedroom apartment) close to Saint-Tropez comes with a Helipad in the beautifully landscaped garden and a wonderful panoramic view of the Mediterranean.